Brigadier General, USA (Ret) Tom Landwermeyer was born and raised in Dallas, TX. He was commissioned as an Armor Second Lieutenant in 1976 upon graduation from West Point, and became an Army Aviator in 1981. During his 33 year military career, he led both armor and aviation units at all levels from Platoon to his final tactical position as Deputy Commanding General of 2d Infantry Division. 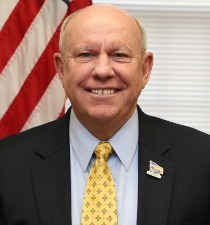 He held key staff positions at U.S. Transportation Command, U.S. Forces Japan and culminated his career on the Army Staff at the Pentagon. His duty assignments have been throughout the United States, Germany, Japan, Bosnia, Iraq and Korea. Following retirement from the Army in 2009, he served as a civilian on the Army Staff in the Pentagon in the Office of the Chief of Staff of the Army. In 2011, he became the Chief Operating Officer for the Armed Services YMCA, a military affiliated non-profit that provides programs and services to active duty junior enlisted Troops and their families at military installations across the country. BG Landwermeyer has been married to his wife Marie for 35 years and they have 4 grown children: a daughter Courtney (Texas A&M Aggie); and three sons; Thomas (OSU Buckeye), Taylor (JMU Duke and 2LT with 25th Infantry Division in Hawaii), and Mackenzie (in his junior year as a Radford U. Highlander).